The battle for the control of content and devices online has been at the centre of European policy-makers’ attention since the internet was created, but it has only increased in the recent years. Without any consideration for scientific literature on violent radicalisation factors, the current paradigm in the area of counter-terrorism leads to a proliferation of mechanisms to speed up the removal of harmful content online without the appropriate safeguards. The most problematic is the mechanism that empowers private companies to become the online police while restricting the checks and balances on the side of the law enforcement agencies. The Referral Units were set up within police forces tasked with the removal of material, which may or not be illegal, from the internet. These Referral Units notify to internet platforms pieces of content which are “likely” breaching their terms of service and request that they remove the content on a voluntary basis − just like other users would do when flagging content, but coming from a law enforcement agency that decides not to exercise their investigative powers and lets a private company do the job instead. In its proposal for a Regulation on preventing the dissemination of terrorist content online, the European Commission expects “competent authorities” (supposedly Europol’s Internal Referral Unit and national referral units) to indicate allegedly harmful content to platforms in the form of referrals. Online content is thus removed according to private terms of service agreements, on the sole decision of private hosting service providers, and not necessarily in accordance with the law. Because of this procedure, the citizen does not have an adequate access to remedies in case his legal content is unlawfully removed. Restrictions on fundamental rights should remain a decision taken only by judicial or independent courts. When establishing the legality of content online, expert legal evaluation is an absolute necessity to prevent violations of the freedom of expression. In the case of referrals promoted by the European Commission, judicial oversight is completely omitted, and sensitive decisions about legality are made by platforms under important pressure from police authorities. Beyond the major concerns this mechanism raises in terms of privatisation of law enforcement and rule of law, it casts doubt upon the ability of police forces to correctly identify illegal content in first instance. Considering that requests submitted by police officers are four times more successful in having the content removed than other users’ requests, it is essential to question the role of police authorities in the content regulation debate. Police authorities have neither the duty nor the expertise to interpret legal provisions determining the limits to freedom of speech, and to distinguish illegal content from nasty but not illegal one. One example relates to the referrals sent by the Belgian and the French Internet Referral Units to the Internet Archive. This website aims at building a digital library of websites and other cultural goods in digital form, in order to provide researchers and the public access to published works. In 2017, the Internet Archive was requested by both national authorities to remove a digital copy of a parody magazine mocking Daesh online magazine “Rumiyah”. While the Belgian authorities simply held that the hoax magazine shares “Daesh Propaganda”, the French Central Office for the Fight Against Crime Linked to Information Technology and Communication (OCLCTIC) considered it violates articles on terrorism and violence incitement of its national criminal code. When actually reading the specifically flagged pages, the reader can note that the magazine only reports the decline of the international terrorist organisation and examples of failed military operations where suicide bombers accidentally blew themselves. It is difficult to argue that this material contains Daesh propaganda or promotes terrorism. Short-cut or the long way around? Among the links referred by the French national police, one identifies a valid piece of Daesh propaganda, of which the access is protected by a log-in requirement. The French authorities added that the hosting service provider – the Internet Archives – had from then the knowledge of this litigious fact. They were referring to the liability exemption introduced by Article 14(1a) of the e-Commerce Directive, according to which the provider is required to remove the content upon obtaining knowledge or awareness. Since the Commission has also not been able to clearly answer whether a referral would constitute “actual knowledge” of the illegality of content, the Internet Archive remains uncertain whether it faces sanctions in case of non-removal. Either the content is illegal and should be subject to a removal order issued by a court, or it is not. Referrals constitute short-cuts for national law enforcement authorities to delete content fast by pressuring hosting service providers, regardless if it is illegal or not − an easy alternative to getting a judicial order. The amendments by the European Parliament Committee on Internal Market and Consumers Protection (IMCO) to the Regulation on Terrorist Content Online suggests the deletion of such measures. Hopefully, the lead Committee, Committee on Civil Liberties (LIBE), will take them into account for the final report. The post All Cops Are Blind? 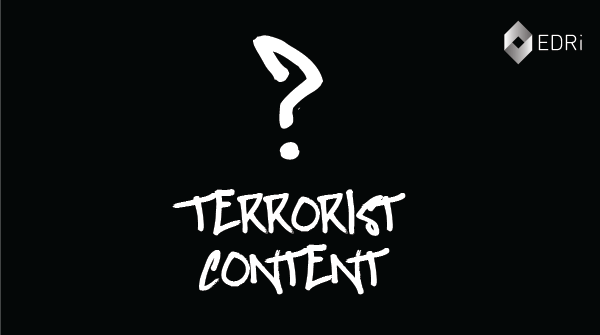 Context in terrorist content online appeared first on EDRi.